We know how to ensure a properly cleaned chimney. Every chimney needs a clean sweep about every year or two. 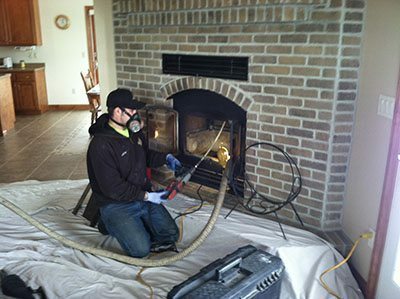 Ablaze Technologies is the leading expert in Chimney maintenance in the Fox Valley and Northeastern Wisconsin. They provide several services, including a 21 point chimney inspection. Their experts will let you know what could be causing soot buildup, backdraft or noxious odors. Regular cleaning is required to maintain the quality and safety of the chimney. Ablaze performs a thorough cleaning from top to bottom. They do this by first climbing to the roof. This ensures that no portion of the chimney is neglected. Ablaze also provides a complete chimney analysis. Their 21 point inspection followed by a detailed report on the state of the chimney. This keeps homeowners fully informed on any cleaning or recommended repairs. In addition, a regular chimney sweep will help prevent fires and ensure the lasting value of the home. There are two other services that maintain chimney integrity and sound structure. One of them is chimney flashing. Chimney flashing is the seal between the roofing material and the chimney. It prevents rain water from running down the chimney where it can damage rafters, walls, joists and other elements of your structure. Leaking chimneys are often caused by faulty flashing and a quick repair is the replacement or repair of this flashing. Waterproofing is another solution to preventing the deterioration of chimneys. By checking one’s attic, one can discover the first sign of chimney trouble. Hairline cracks can occur even in new construction because of mortar shrinking during the curing process. Defective mortar joints and deteriorating brick result in greater water damage. However, several new products are effective at waterproofing chimneys. These new sealants allow the masonry to breathe out condensation but not take it in. There are many additional services Ablaze offers in conjunction with a chimney sweep. While no service is typical, Ablaze works with every customer to maintain a working chimney and prevent structural loss. Homeowners concerned with the integrity of their chimney contact Ablaze Technologies because they trust Ablaze’s full service experience.